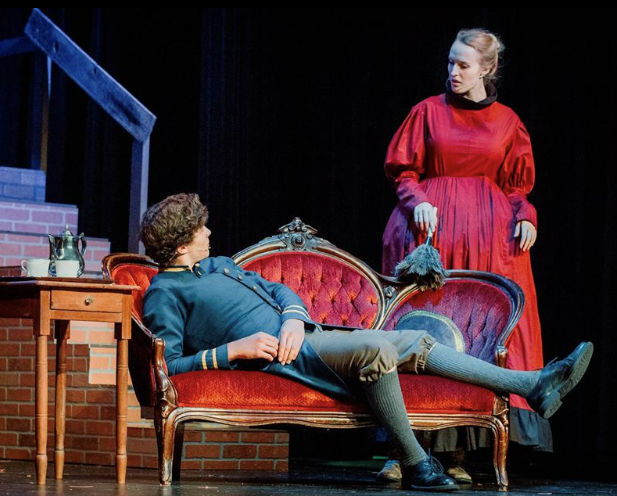 The Lakeville Area Arts Center put on a production of Oliver, which featured one of Cannon Falls' own actresses. When Josie Ramler entered the stage sporting a fat suit and a nasty expression, I knew the show was going to be a treat. Performing at the Lakeville Area Arts Center, a group of homeschoolers executed a wonderful production of the musical Oliver. Even with a young cast and main character, the whirling youngsters sang chorus after chorus on point and with vigor and buoyancy. Taking place in England, this 1960 musical opens the show with a group of orphans. The main orphan, Oliver, causes some disturbances among his peers and is sold. However, after running away, he wanders the streets of London and gets mixed up in the wrong crowd. Stealing and pick pocketing becomes his new way of life, and Fagin and Dodger, two pick pocketing experts, take Oliver under their wings. However, after being caught in the act of stealing, Oliver is noticed by an old man, Mr. Brownlow, but one of Fagin’s acquaintances, Bill Sikes, feels the need to keep Oliver under his watch. Playing the part of Widow Corney, a crucial member of the workhouse staff, Josie Ramler hustled and bustled around the stage. Her emotions, facial expressions, and accent were brilliant. Her mother Renae Ramler loved the accent that her daughter was able to masterfully pull of claiming that “It’s so funny! I crack up every time she says something!” Many of the younger members of the cast also had accents which was very impressive and showed how devoted they were to their characters. Josie’s favorite part was the song “Oom Pah Pah because it’s when everyone can go crazy and ad lib.” On top of that, she also like the song I Shall Scream because “the audience always laughs so much”. While all of the actors did a phenomenal job and had brilliant accents and character dedications, one more character should get a shout out. Fagin’s character and actions were extremely clever and well done. Instead of just gesturing, he would do finger waggles, and his character had a lot of awesome quirks that were creative. My favorite part was when four simple characters entered the stage. A rose, milk, and strawberry seller, as well as a knife sharpener beautifully sang the song Who Will Buy. The song was slightly eerie at first but after striking many harmonious chords, the song continued to torment my brain even a week after the performance. This goes to show that you don’t have to be a main character to create a memorable performance. The cast made use of the tiny stage very well and filled the stage room with their presences. Young cast members did a phenomenal job and had a lot of cute but complicated dances that they seemed to perform with ease. Although she hadn’t seen the show before, Kendall Lawless loved it and thought the the kids really “made the characters come alive”, and she thought that each character was very pronounced. Josie Ramler had also daringly been a part of two musicals, Oliver and Grease, at the same time, yet she has been equally devoted to both characters. After her dramatic transformation, I can’t wait to see what she holds in store for us as she plays Rizzo in Grease.